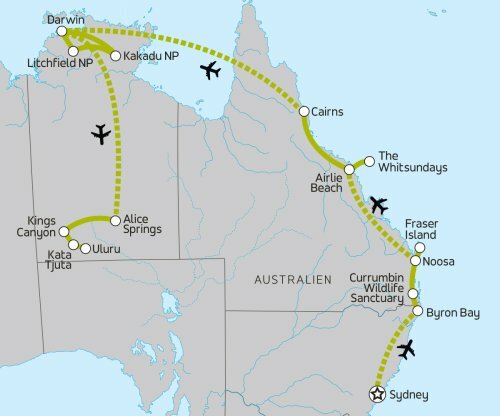 Entdecke bei dieser großen Australien Abenteuerreise von Sydney über Darwin nach Uluru die Höhepunkte der Ostküste, des Northern Territory und des Roten Zentrums. Von Sydney führt uns ein Ausflug in die beeindruckenden Blue Mountains mit ihren atemberaubenden, waldreichen Canyons, steilen Felswänden und interessanten Felsformationen. Teste bei einem Surfkurs in Byron Bay dein Talent beim Wellenreiten. Auf einer typisch australischen Farm bekommst du Einblicke in das Farmleben. Im Currumbin Wildlife Sanctuary lernst du die australische Tierwelt kennen und vielleicht kannst du sogar einen Koala streicheln. Erkunde mit Fraser Island die größte Sandinsel der Welt und entspanne an den traumhaften Stränden von Queensland. Ein weiterer Höhepunkt ist unser fantastischer Segeltörn durch die paradiesische Inselwelt der Whitsundays. Ein Highlight ist der blendend weiße Whitehaven Beach, der zu den schönsten Stränden der Welt zählt. Schwimmen, schnorcheln und chillen lautet das Motto während unserer Segelkreuzfahrt. Entdecke die einzigartige Tier- und Pflanzenwelt des Kakadu Nationalparks und die einzigartigen Aboriginal Felsmalereien. Herrliche Wasserfälle im Litchfield Nationalpark bieten Erfrischung. Den grandiosen Abschluss unserer Reise bildet der berühmte Uluru (Ayers Rock). Im roten Zentrum wandern wir zu den grandiosen Felsschluchten des Kings Canyon und durch die Felskuppeln von Kata Tjuta. Erlebe den einzigartigen Sonnenuntergang am Uluru - ein einmaliger Moment! Ein bunter Mix aus grandiosen Landschaften, wunderschönen Nationalparks und der Kultur der Aborigines erwarten dich auf dieser Erlebnisreise durch Australien für junge Leute. Die Unterbringung erfolgt in Mehrbettzimmern. Gegen Aufpreis ist auch die Unterbringung in Doppel- oder Einzelzimmern möglich. Aufpreise bitte bei uns anfragen. Übernachtet wird in zentral gelegenen Hotels, den besten legendären Backpacker-Hostels und dazu in Special Stays mit dem besonderen Kick. - Sydney Sightseeing Tour inc. Mrs Macquaries Chair, Opera House, Ferry to Watsons Bay. - Phillip Foote Dinner - "Cook your own BBQ"
With Sydney satisfaction levels at a high this morning we jump on a plane to Byron Bay where all your hippie dreams can come to life. Landing in Byron Bay, we'll drop off our bags at the accomodation and start as we mean to go on, heading straight to the beach. Here in Byron we'll unleash our secret talent for surfing with an included lesson. You'll be a pro in no time! It's time to wave goodbye to Byron Bay and head up the coast to Noosa Everglades. On the way north we'll stop at Hosanna Farm, an authentic Aussie working farm where you'll get the chance to try some traditional Australian tucker: damper & billy tea. Next up we'll make our way to Currumbin Wildlife Sanctuary where you'll see native Australian animals including kangaroos, emus, crocodiles, dingoes and Tasmanian devils. Still buzzing from our farm & wildlife adventures, we'll arrive at our destination, the Noosa Everglades. Here we'll unpack at our Special Stay Eco Camp home for the next two nights and relax with a group dinner in the bistro & bar area, surrounded by the chatter and rustling of local birds and kangaroos. Wake up to the sound of birds chirping at our Eco Camp this morning (you might even spot a kangaroo) and grab a quick brekkie before heading out for a day on Fraser Island. Your spirits will be at an all-time high after this day full of sand dunes, scenic lakes and dense rainforests. We'll cruise along the world's longest sand highway before you appease your hunger with a tasty lunch. Say goodbye to The Glades, we're on our way to find coastal nirvana at the pristine beaches of the Whitsundays. We'll hop on a plane for a flight to Airlie Beach. Landing in Airlie Beach, you'll notice everything starting to look a bit more tropical. Hello Whitsundays! We'll head to the marina where we'll begin our Whitsundays sailing adventure and meet our crew before bunking down on our sailing yacht for the night. What can top the Whitsundays? Not much… except the Great Barrier Reef, and luckily it's the next stop on our journey. After a scenic train ride along the East Coast of Queensland, we'll arrive in sunny Cairns - a haven for vibing restaurants, bouncing clubs and endless tropical feels. This town is the gateway to the reef and is buzzing with energy, you won't be short of things to do here. Wave goodbye to the east coast this morning - it's time for a change of scenery! Board your morning flight to Darwin and get ready to greet Australia's best-kept secret, the Northern Territory. After landing in Darwin, we'll waste no time getting into it as we head out for an optional visit to Crocosaurus Cove for the brave souls among us. This unique visit lets you get up-close and personal with these primitive predators at the world's largest display of Australian reptiles. And if that's not enough, take the opportunity to swim with the crocs in the ominously named Cage of Death. Are you brave enough? We'll make the most of the day by heading to Litchfield National Park where we'll check out the enormous termite mounds, lush rainforest and famous Florence Falls. Here we'll hit Florence Falls - four waterfalls pouring over a wide plateau into into deep, picture-perfect water holes surrounded by thick rainforest. Grab your swimmers to take a heavenly dip in the crystal clear waters (seasonal). More adventure awaits us this afternoon as we head to Kakadu National Park. Here, we'll explore the breathtaking beauty of the surrounding National Park. Fully immersed in these timeless lands, we'll settle into our unique special stay for tonight, the Bush Bungalows. Today we'll hike to one of Kakadu's most famous beauty spots: Ubirr lookout. Passing Aboriginal art sites we'll reach the lookout and gawp at the rainforest ribbons, winding woodlands and sweeping floodplains. See ya Kakadu, we'll never forget you. Hiked-out and humbled by all the natural splendour, tonight we'll head back to Darwin for the night for a much deserved rest. But first we need to tick another box: 'bush tucker' and boomerang throwing! Today we board a flight from Darwin to Alice Springs and then on to Uluru. With authentic Australian experiences high on our agenda this is the place to be! A quick visit to Simpson's Gap, a remarkable rock formation, will whet our appetites before we reach the most iconic rock of all, and a bonafide trip highlight: Uluru. A quick stop at ANZAC Hill after touching down in The Alice, to get a birds eye view of the unofficial capital of the Outback and to also learn about Australia's fallen soldiers in the 20th century wars. Afterwards we drive to Uluru. Here we'll settle into our lodge, ready for a few days of exploring this jaw-dropping destination. Before your head hits the pillow, we'll make our acquaintance with The Rock, glass of bubbles in hand and the sunset casting a glow over the Outback's most picturesque backdrop. Plant immer so, daß Ihr schon am Tag vor Tourbeginn am Ort seid und auch am Ende im Ankunftsort noch einmal übernachtet. Die preiswerten Gateway Hotels solltet Ihr gleichzeitig mit Eurer Tourbuchung reservieren.